If you lived in a house with the address 5 Station Road, it probably wouldn’t surprise you if you learned that there was another house somewhere in the country which also had the address 5 Station Road. There are, after all, over 2000 streets named Station Road in the UK. The fact that you sometimes get streets quite close together with the same name can be confusing. 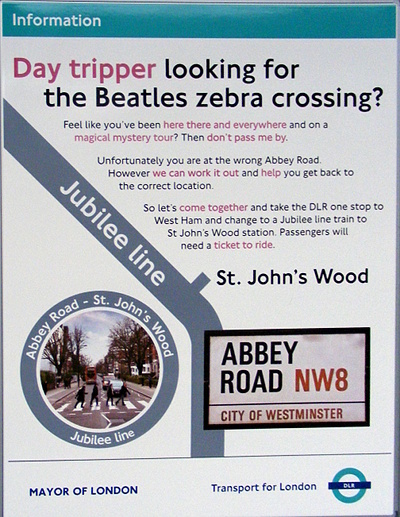 In London, there’s a sign on the platform at Abbey Road DLR station telling tourists, via the medium of appalling puns, that if they’re looking for the Abbey Road made famous by the Beatles, they are, in fact, in the wrong place. The Beatles’ Abbey Road is 12.5km away from the Abbey Road DLR station. I found myself wondering what the shortest distance was between two Address Twins – houses with the same number and the same street-name. Unfortunately, I can’t find a publicly-available list of every house in the UK – Royal Mail have house address data, but you have to pay a minimum of £399 to licence it. But I do have an Ordnance Survey list of every street in the UK, so my plan was to find every pair of streets with the same name, calculate the distance between them, sort them from nearest to furthest, and then go down the list looking on Google Streetview until I found two houses with the same number. Easy! So I removed uniquely-named streets, and calculated the distance between any two streets with the same name. I found that there were pairs of streets which were only a few metres apart. When I had a look on a map, I discovered that this appeared to be because if a street had a spur coming off it, that spur was sometimes listed as a separate street. I also discovered that there were streets which had been fairly long in the past, but something had happened to split the street in two (like they built a park, or a school in the middle of it), and now the two ends of the street were listed as two different streets. Obviously, in neither of these cases would there be any house-numbers in common, so I needed to get rid of them. Two streets with the same name, less than a kilometre apart, with at least one house-number in common! Blimey! Um. So instead of discarding everything under a kilometre, I could actually discard everything over a kilometre! Wow! At least that means a huge reduction in the amount of data! This still left a lot of data though, and no way I could think of to procedurally remove the spur streets or split streets mentioned above, so I went through the data by hand. This, by the way, showed up loads of errors in the Ordnance Survey data. The OS manage a vast amount of data and errors are bound to appear. If an error is of a type which is unlikely to be spotted during ‘normal’ usage of the data, it might never be found until some weirdo comes along, uses the data in an unorthodox way, and finds all the hidden flaws. When I made my town & street name search apps, I’d already found numerous errors in the OS data, but now I found a load more – especially duplicated streets. In one case, they had seven streets named Church Meadows within metres of each other. They turned out to all be the same street. Seven streets gives twenty-one pairs of streets – all erroneous. Aaaarrrgh! Yes! The bit you actually care about! When I first wrote this blog post, I had here a top five of closest Address Twins, but for reasons I’ll get to later I’ve reduced it to just number one. The distance is front-door to front-door as measured with Google Earth’s ‘ruler’, rounded to the nearest five metres. 2 George Street BB5 0HD, and 2 George Street BB5 0ET, both in Accrington, Lancashire, are only 235 metres apart. Yes, that’s right. These twins are less than a sixth of a mile apart. When I set out to find the closest twins, I thought they might perhaps be around a mile and a half apart, which would itself be quite silly. But 235 metres is definitely in the “What were they thinking?” category. It’s possible to stand at a point midway between the two houses where you can see both of them without moving. Sadly, you can’t quite see one house from the other. So, I was happy with that result. I wrote up this blog post, and I even visited the houses in Accrington and took some photos, while I was there for an exhibition. Before I posted this, I discovered that HM Land Registry make available data on their website about property sales in England and Wales. You can download all standard and additional price paid data transactions received at HM Land Registry from 1 January 1995 to the most current monthly data. So I got a copy to have a nosey. I noticed that, amongst other things, the data contained the house number, street name, and postcode of almost every house that had been sold since 1995. Now obviously this is not a complete list of every house in the UK, but because it was the nearest thing I’d found to a list of individual houses, I was intrigued as to whether it might show up any additional insights into the nearest address-twins. Obviously there was a lot of data, and no geographic data which I could use directly to calculate distances between houses, so I generated a list of every pair of houses which had the same number and street name, and had different postcodes, but where the postcodes only differed by the last letter – because I guessed that very close address twins were likely to have very similar postcodes. The data was incomplete anyway, so I was just doing this out of curiosity. I realised that one of my fundamental assumptions had been incorrect. I assumed that you couldn’t get two houses close together with the same number on the same street. Clearly you could. Those two houses are only about 130 metres apart. So all the work I’d done up to this point was for nothing. So now I had a choice. All the Ordnance Survey data was no longer useful. If I wanted to continue with the Land Registry data, then it would mean a lot more processing, because there was more data to start with, and none of it had any position data. Also, even if I found the closest address twins, I’d have no way of knowing if they were genuinely the closest in real life, because the data wasn’t a complete list of every house – As well as not including Scotland, it’s possible that there were entire streets where no house had been sold in the last 20 years. So… on we go then. So I removed duplicate addresses (if a house was sold twice, it appeared in the list twice, etc.). Then I removed flats (because they all share an address and just screw up the results). Then I found every pair of address twins. Then I grouped all the pairs by street. Then I geolocated the postcodes of every pair of streets. Then I calculated the distances and sorted the list by nearest to furthest. The resulting list still needed work because of a few factors: Firstly, the original file contained legacy data, so if a house changed postcode for some reason, it might be listed under both postcodes. Secondly, it appears that sometimes new-build houses are sold before they’ve had a postcode assigned, so the first time they’re sold they use a random nearby postcode – which means that, again, the same house might appear under two different postcodes. And thirdly, some of the postcode geolocation data was wrong, because of course it was. My enthusiasm was starting to flag by this point, so I thought that the first thing I’d do was to find the two nearest address twins which were in completely different postcode areas to each other. This involved processing much less data, and at least I’d have a result of some description – which would hopefully be an incentive to find the ultimate result. See these two houses? They’re both number 443 Manchester Road! The one on the left is in Bolton and the one on the right is in Salford, both in Greater Manchester. They’re literally next door to each other! I cannot get over how ridiculous a situation this is! It’s possible to live in a house where your next-door neighbour on the same street has the same house number as you! I spoke to a chap who lived on the other side of the road (who, quite rightly, wanted to know why I was taking photos of people’s houses). Apparently they’ve been trying for ages to get the two councils to put up signage to clarify the situation. You can see in the photo the sign on the Salford side which says “Manchester Road, Clifton”, but without a corresponding sign on the Bolton side, or maybe arrows to indicate that “Clifton” refers to the area to the right of the sign, it doesn’t really help. So, the answer to the question “What’s the shortest distance between two houses with the same number and the same street-name?” is “no distance at all”. PS. You may have noticed that all the houses I’ve mentioned are in the North of England – particularly the North-West. This seems to be a trend. Of all the many twin-streets I looked at which I haven’t mentioned here, I’d say that at least 80% of them were in the North, particularly the North-West. I’m not sure why this is. My guess is that people used to have very localised lives, and it didn’t matter that lots of streets had the same names. The reason this situation remains in the North-West, I’m guessing, is that compared to other areas of the country, very little regeneration has taken place since then. PPS. It’s unlikely you’re thinking of actually visiting these houses, but I was nerdy enough to do so, so you might also, in which case remember that these are private houses. Don’t hassle the people who live there. Try not to look like you’re planning a robbery. You know, just be sensible about it! Originally this post confused Salford with Manchester, because Salford is in the Manchester postcode area. This has now been corrected. Sorry Salfordians. An issue that may be relevant to your searches …….. Though his house was on Halifax Road and there was also a ## Halifax Road, Keighley. Our house (in Thornton, Bradford) has a similar arrangement. There is a sign at the end of our road with the name of our road on it but no sign for the run of houses which provided the “namespace” for our house number. 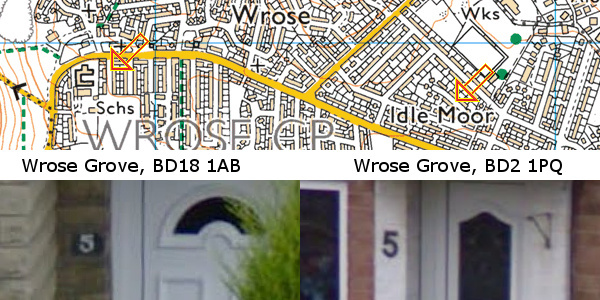 Fortunately, in our case, there is no other house on our road with our number – even though it’s a long road whihc later forks and both forks (on older maps but not today) continued the same road name. Needless to say, this type of address causes endless confusion for computerized address systems, satNavs, taxi firms and delivery firms. I’ve got the same in London. That’s weird. I’d assume it’s the same as if you had a flat in a named block. Like a friend of mine is ## Jacksons Warehouse, Tariff Street, Manchester. Which as two blocks down my street. I spent a fun 20 minutes trying to find my holiday home because I knew it was “Number 3 at Settle”, and I knew what road it was on, and foolishly I thought that would be sufficient information. There are at least four “Number 3″s on that road, and I have visited them all. There is a ‘twin address’ in Queensbury, two 52 Brewery Lanes within a mile of each other and it drives us crazy! The amount of deliveries going awol is frustrating. Once again it has happened today, now I am researching how to get ours changed. Anyone know? Fascinating research, thanks for a great article 🙂 Incredible how nobody at the council seems to think that the double-443 is a problem! When we first moved to our current place, near Boston in the US, we were caught out by a long road that continues from one city to another – and the numbering goes the opposite way in the neighbouring cities, leading to a reflection just like Manchester Road. So we got off our bus in the middle of nowhere instead of a major shopping centre like we’d thought. I think the trouble with 443 Manchester Road is that there are two councils. From a UK point of view that explains the situation completely. From a definitive point of view, they are actually two different streets. The one in Bolton has a different entry on the NSG to the one in Manchester. I think the fact that they’re considered two different streets shows quite nicely the difference between the real world and the “administrative” world! In the real world, nobody would end a bike lane abruptly, just because it got to an arbitrary administrative border. But that’s exactly what happens here! Transport is under the remit of the new Mayor of Greater Manchester, so perhaps the cycle track thing will now get sorted out. My breath is thoroughly bated. The twin 443s are a different matter, along with the not so close but still easily confusable 441s, 439s, 437s etc. It sounds easy enough to solve – you could just rename and renumber the stretch from 400 in Bolton to 400 in Salford – but I’d bet the residents would be up in arms. Have you tried urban British cycle lanes?! Well… There have been some abrupt bike lane ends at administrative borders in Iceland! What a post, fantastic work. Apparently in London in the late 19th C the Post Office insisted on a lot of changes to road names to avoid this sort of thing. I guess they did this less in other places. Manchester did this in the mid 20th century; there are no two roads with the same name in Manchester. Unfortunately, that doesn’t stop confusion with the surrounding towns. I was also thinking of Bold street reading this. The US Post Office got rid of a lot of silliness in the 19th century when they said that they wouldn’t deliver post to a town with the same name as another town in the same state. I don’t know about duplicate street names, but they probably got rid of them as well: in the UK one can have several streets with similar names, like Park Road, Park Street, Park Avenue etc., in the same district, but I don’t think that happens in the USA. I live in a neighborhood that has 5 variations of Denver West all adjacent or intersecting. I also lived at place in New Mexico that had 3 different and valid addresses depending on how you looked it up. Oh, it absolutely does – in the New York City borough of Queens, there is an area where you can have a numbered “Avenue” followed by the same number “Road” and the same number “Drive” before you get to the next number “Avenue”. The cross streets are “Street” followed by “Place” and “Court” before incrementing. Great article, not just because it makes me feel so much better about raving about an article in the Book of the Old Edinburgh Club on Edinburgh street-renumbering in the 19th century. That’s fantastic! I love oddities like this. I’ve wondered in the past if streets exist where the speed limit is different in opposite directions. I’ve never come across any examples. Well I suppose one way streets could be considered 0mph in one direction and normal in the other! Not quite speed limits that differ, but in Cheddar there are a couple of roads (Venn’s Gate and Hannay Road) that are one way for HGVs but two-way for other traffic. Oh, so HGVs take one road in one direction, and the other in the opposite direction? In Manchester is a road that is one-way for both cars and bikes, but in opposite directions! Although it does look (in the latest StreetView) like it’s now two-way for bikes! Sidney Street in Manchester M1 (Just off Grosvenor Street) is one way for bikes and one way in the other direction for motor vehicles. If you view it on Google Earth there is a supremely ironic picture of a bike going the correct way on the motor vehicle side of the road! Yes! Part of the A10 dual carriageway between Cheshunt and the M25 is 40mph northbound and 70mph southbound if I remember correctly. The only case I know is on a duel carriageway on the A31 at Trickets Cross in in Dorset. Going west the 50mph limit ends almost as soon as you leave the roundabout. Going east it comes into effect about 500m before you get there. I’ve often wondered if this is strictly legal or if the 50mph actually extends 500m from the roundabout on both sides but whoever decided where the signs should be placed was a sensible human being and not a robotic jobs worth. For a long while there were roadworks on the A30 in Basingstoke. Apparently the council decided that the entire part of the road from the previous roundabout running up to the roundabout beyond which the roadworks started needed a 30mph speed limit. But they left the 50mph speed limit in the opposite direction. It was an immensely frustrating road to drive down (at the speed limit, as I do) as it was also quite a wide road but only one lane per direction, single carriageway so people would try rather dangerous overtaking, on a busy road, with a closing speed of 80mph. After a couple of months but before the roadworks were finished I think they put the speed limit back to 50mph. I used to live in The Street, Bredgar, Kent. Most of the houses have names but among those with numbers are three number 1s and three number 2s. Really? Wow that is odd. Are they 1a, 1b, etc. or literally all the same? I’ve seen Google Maps shortening Saint Street to St St before. This is fascinating. When you start looking at addressing, you often realise the massive number of weird edge cases that are totally silly! You mention problem with getting data, do you know about OpenStreetMap? It’s an open source/open data map database. It covers the whole world, but was started in the UK because the OS doesn’t share their data (“We’ll just make our own map!”). You can store address data there. It might be another data source for you. It’s far from complete for address data though. Street corners can cause more deliver issues, we had a courier deliver to the same street number wrong street (intersecting), since in his haste he matched street name and number without realising the number belong to intersecting street. Similar to Mike Ward, and not that far away, I lived on Albert Square, Yeadon. The postcode for the terrace was LS19 7##. A block of old garages neighbouring the houses was demolished and eventually developed as a sheltered accommodation called Albert Court but given the same postcode, so there were now four flats with the same numbers as four houses and the same postcode. I had to drop mail into the flats quite regularly. I believe it’s since been fixed but was an oddity of the allocation process. You’d think that people would anticipate these kind of problems when building new houses! In my country it’s the council that assigns a street name/number to your house, so you may not have anything to do with it. That said, if there are no numbers to assign, like you build between a 1 and a 2 on a street, you get a 1a or such. Another weird address thing happened at my home town. The local electricity company decided to built a new office building. Unfortunately their old building had already number 1. So, the address for the current building is Kirkkopuistikko 0. Yup. Zero. You can guess how much issues that causes….. 🙂 In Finland we give the number after the street name, if you were wondering about the format. And if you are wondering what the heck means Kirkkopuistikko, it’s basically ‘Church park’ or ‘Church esplanade’. I have another blog post half-written which covers this. There are lots of quirks just in the way houses are numbered! You might want to look at Lainey’s Close in Marlborough SN8 1BS. Between the junction with Blowhorn Street and North View Place, the houses on the east side of the street are in Lainey’s Close, whilst those on the west are in Chiminage Close, a name that does not appear on most maps. How strange! From looking at a large-scale map, it looks like the road is Lainey’s Close, and the pavement is Chiminage Close! The best part of this blog post being popular is that I find out loads of quirky stuff like this! I know of at least one house numbered zero in the UK, in Middlesbrough. The house was clearly built after the rest of the terrace and is quite an odd shape, so I wouldn’t be surprised if there are others in parts of the country built in similar ways at a similar time. This was a massive rollercoaster of emotions. They have two 441 neighbours as well! But the obvious question then is why doesn’t one of them change their number to 443A or B to avoid confusion? Good question. I have no idea! I had a look at 2 George Street BB5 0HD, and 2 George Street BB5 0ET, which you say are both in Accrington. Looking at old maps I can see that George Street BB5 0ET was actually in Oswaldtwistle at the time it was named. When northern towns were expanding quickly with industrialisation, I suppose it was common for separate councils to name their own streets without consulting neighbouring authorities. When I originally wrote the post, I wrote more here, before deleting it all when I realised it *wasn’t* the closest. Both these streets were originally opposite different mills, and I hypothesised that they were probably mill workers’ houses, built by the mill owners, who named them as they pleased (“George” after the then-current Prince George). My business address has a neighbouring building with the same number. We are both 4 Sopwith Way, I can see the building from my office window it is on the opposite side of the road. Of course we frequently have to exchange parcels / letters. What an amazing read Paul. I am also amazed at some of the addresses here in NYC, during the time when Robert Moses allegedly laid out all the streets, it’s amazing to me to see bizarre fractional addresses like 32 1/2. We also have a 6 1/2 Ave. There are a whole set of Avenues of the style Avenue P 1/2 in Galveston Texas. I am so delighted that someone spent the time to do this research. Bravo, sir! Near me Bolton Rd Heath Charnock becomes Bolton Rd Addlington which confused the heck out of me when I was knocking on the wrong door not that far from where I wanted to be. Have you seem what3words.Com? It seems like a brilliant solution to other wise identical addresses. Yeah. I think it’s great. The only negative is that it’s not open source, sadly, but certainly much easier to remember than latitude/longitude! A previous rental was 1 L* Rd. Across the street was 1 P* House, L* Rd. Turns out we were the first tenants to point out to the energy suppliers that we were getting free energy as they were charging the wrong address. Took months to sort out, including them then trying to charge us back payments for the other address. Thank you for the research, this was fascinating. I now try to use what3words.com for everything… But that wouldn’t have been anywhere near as much fun! Great analysis. I think you would be eligible for the Ordnance Survey Data Exploration licence which gives 3 months free access to the data set formed across Ordnance Survey, councils and Royal Mail. It specifically mentions hackathons and mashups as valid uses, so personal use would seem ok. Thanks for putting your teeth into that. I guess nr 441 is second on your list of close distances. The whole road looks mirrored on the odd nummbered side. Something went wrong on the even numbered side. On both sides there are lengthy gaps between houses, e.g. where there is a park, and even non-continuous numbering, e.g. where there has been redevelopment. The Bolton one (which is actually better called the Kearsley one, as there are several other ones in Bolton) is slightly longer, but only by about 30m. I used to live at 6 Park View, Lower Bristol Road, Bath. There was also a 6 Park View, Upper Bristol Road, Bath. We were forever getting their Pizzas and on one occasion, their Policemen. The Upper Bristol Road version actually has a view of a park, so probably had the more legitimate claim over the name! Also in the Mid 1990’s the Post Office changed many postcodes for many properties. My parents house got a new one for instance. I wonder if the two 4 Chorley Roads are/were the same house sold both before and after the Post Offices postcode re-hash. Nope, they are two separate houses. Also, the rest of the street is numbered similarly – so there are two number 5s, two number 6s etc. as you get further from the central point. A couple of comments on this. Firstly, as you’ve already discovered, the OS data isn’t really useful for this. But that’s because the OS is a mapping agency, and, like a dictionary, its function is to record, not define. For the real, definitive data, you need the National Street Gazetteer. Unfortunately, the NSG isn’t open data, but it is exposed as a layer on roadworks.org, so it is at least visible. Secondly, although houses on the same named street (in reality, different but contiguous NSG streets) can have the same number, the combination of number/address_unit/postcode is unique (although, as per S’s comment above, the address unit is not necessarily the street – it can be a block on the street) . So if you have access to a postcode list, that’s another angle to explore. On a related note, although what3words isn’t open (and therefore doomed to irrelevance, but that’s another matter), mapcode is. And that’s probably easier to use anyway. Mark. Your comment on uniqueness is not strictly true. The house I live in is split into flats. There are two front doors. The basement (one flat to itself) has address Flat 1, [house no. street no.] while the upstairs is just [house no. street no.]. However, the upstairs is split into eight separate flats numbered 1 through 8. So my address is Flat 1, [house no. street no.]. I shall leave you to imagine for yourselves the jolly games I get to play with various official bodies. Two of these bodies have shown truly remarkable levels of intelligence and flexibility and called one of the addresses 1A. Well done they! It would have been even better had they chosen the same one. So Paul. I think that beats even your record for twin addresses, we must be about ten feet apart. Ha ha! Well I deliberately excluded flats, just because they all share a house number, and it was house numbers I was specifically interested in. But yeah, you might have the record for closest flats with the same address. The problem is that data about individual flats would be even harder to find than data about individual houses! Also, what were the people who numbered your flats thinking?! Shouldn’t be routing traffic through there, that’s for sure. Yeah, I found lots of quite close twin streets with no houses on them. Because I was looking for twin houses specifically, I ignored them, but there were streets with other buildings like shops, or streets in industrial areas. I imagine that they might cause a lot of real-world confusion, since commercial properties probably get more post on average. And there are 6 443 Manchester Roads in the general area marked on google maps – not indicating that 1 is a double means at least 7 such houses! Yup, they are common! In fact my flat is about 200 metres from a 443 Manchester Road! We live in a village in Lincolnshire on [hamlet] Rd. The village on the other side of the hamlet has [hamlet rd]. In the hamlet, the road is renamed [village1] rd for a few meters then it changes to [village2] rd. All the same road. Our address Twin is about 3/4 mile away in the next village. The more complicated issue though is our house is perpendicular to the road and was a farm house split in the 30s, so the part that faces the road is y [hamlet] Rd and our house (x [hamlet] Rd) is only accessible by driving across the bottom of y’s garden, of which we have a 6 foot right of way. Now picture the number of delivery drivers who think x doesn’t exist and that our street only has w, y, z. In fact for many years our house didn’t exist in Sat nav/google maps! I’ve had packages delivered where a map print out was taped to the box! In the first case, you’ll note the houses have been numbered from the Clifton (Manchester) end, increasing the further away from Manchester you go, while simultaneously the numbering on the Kearsley (Bolton) end also increases the further away from Bolton you go. Thus, as the road got built up over time, they have met in the middle at the district boundary. The extraordinary coincidence is the same number they arrive at. In reverse, we have the Adlington and Heath Charnock situation whereby the house numbers start at the boundary and increase in opposite directions towards the respective villages. I suspect there’s probably more of the latter type out there (though not as impressive as the examples you’ve found). I can’t remember where I heard this but apparently in some countries/regions the numbering is chronological as opposed to geographical. So the houses are numbered according to when they were built and not where they are located. So you can have a #1 at one end of a road and #2 at the other and then numbers will be randomly filled in between as the space is used. Googling to confirm only comes up with this (https://en.wikipedia.org/wiki/House_numbering) which mentions it used to happen in German villages, and independent of the street. Which is one way of making sure you don’t get a nearby twin. 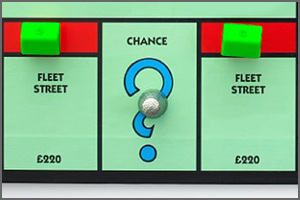 To make things more complicated, the first one has street numbers running 1-2-3-4 etc on both sides of the road, however the second one has more traditional odds on one side and evens on the other (despite each side having different names). Oh wow, I think this is my favourite street oddity so far. It’s interesting how different mapping sites deal with this. Google just chooses one of the names. Streetmap ignores both names and acts as if these are continuations of the streets on the other side of Coatsworth Road. Bing chooses one name for the southern road, and uses both for the northern road. I think Google do the same as Bing with the northern road if you zoom in enough. I grew up on one of these, and in those days Google also just made them continuations from the other side of Coatsworth Road. I was always so upset that “my” road was missing from Google! Again a tangential quirk, but assuming sequential numbering ona street even in the UK can lead you to difficulties. Anyone trying to find the Nesta UK HQ at 58 Victoria Embankment will struggle if they haven’t looked at the map on the website in advance. (http://www.nesta.org.uk/contact-us). The numbering sequence goes 40, 58, 50, 56, 60. This reminds me of my favourite street. It’s Whip-Ma-Whop-Ma-Gate in York. It’s very short and has two two doors on it. In your search you have probably discovered for yourself a lot of what I know about addressing. However if you want to talk to an address custodian I am happy to share what I know. There are too many historical agencies involved in addressing and still to this day a myriad of influences that effect addresses making it difficult to avoid these issues. Once an address comes into existence it will appear on deeds and legal documents relating to the property making it impossible to correct an issue once it has arisen. So it is understandable that these anomalies can be found. They give self confessed nerds something to do. Wisden Road and Jessop Road in Stevenage are interesting too. Technically, both of them are just one road each, although all their tributaries also have the same name, so it can be quite hard finding a particular house. In Mozambique houses are numbered in metres from the end of the street. Specifically, to the nearest odd no. of metres on one side, to the nearest even no. of metres on the other. They use that system in Chile — I don’t know if it’s universal, but it certainly applies in Santiago and Valdivia. Before we were married my wife lived at No. 1492, but the next door house was something like 1470. Her house was 1492 metres from what was considered to be the beginning of the street. The numbers don’t go up by 100 with each block, as in the USA. Closer to home, there’s a road that uses this system in Kingswinford, in the West Midlands. For interesting numbering the last two roads we have lived in, both cause lots of confusion! Streets with no houses on them? There’s one in Skipton, North Yorkshire (Henry Street) off Keighley Road. A slight variation: There are also duplicate streets in the same town, distinguished by some other identifier (in addition to postcode). For instance: I live at n, Streetname, Suburb, POST TOWN. There’s also a house at n, Streetname, in the centre of POST TOWN. Royal Mail manage to tell the two apart, but lots of other people don’t.